Did you know that there are many different kinds of nose surgery other than cosmetic rhinoplasty? While that’s certainly a very popular choice for many patients seeking an effective way to enhance their aesthetic appeal, there are other kinds of nose surgery, each with a different intended outcome. Everyone’s body is unique, and therefore, all cosmetic surgeries—and all surgeries in general—will be slightly different. Let’s explore the different kinds of nose surgeries available and which purposes they serve. Reduction rhinoplasty does exactly what it says: it reduces the size of the nose. When patients opt for this type of surgery, they can choose to reduce the overall size of the nose or concentrate on specific areas that need to become smaller, like the tip, a hump or bump, and more. During this process, the resizing is often done by removing cartilage and/or bone from the nose to achieve the desired shape and size. Reduction rhinoplasty begins with a consultation between you and a facial plastic surgeon. At this one-on-one meeting, you’ll have the chance to discuss your nose, what you don’t like about it, what you do like about it, and what you’d like it to change about it. If you’re talking a lot about how big your nose is, your surgeon will know to start including reduction rhinoplasty techniques into his surgical plan for you. During this consultation, your facial plastic surgeon will also examine your nose, measure the proportions of your facial features, and get an idea of the exact changes you desire. These steps allow him to design the right approach that will solve your problems and get you the results you really want. Most rhinoplasty surgeries are approached in a similar fashion, they all begin with incisions, either in the closed or open style. Regardless of where your incisions are placed, cartilage and/or bone will be removed to lessen the size of your nose. If you are only looking to reduce the size of certain aspects of your nose, like the nostrils or a hump, then this is where your surgeon will concentrate his or her efforts. Adjustments will be made in line with the surgical plan you discussed in your consultation until the desired result has been achieved. The skin on your nose won’t be trimmed down during this procedure, since it will shrink to its new size completely on its own. When your reduction rhinoplasty is finished, your nose will be more proportional to your other facial features and less likely to draw unwanted attention. During this treatment, the doctor performs bone or tissue grafting to build up the nasal tip and/or bridge. In many cases, he or she uses cartilage from other parts of the nose, usually the nasal septum. 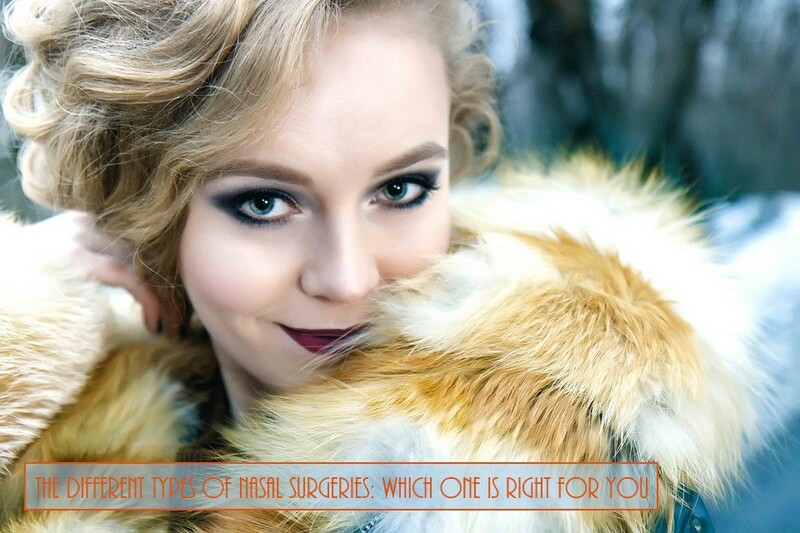 However, if a patient does not have enough tissue in this area a number of materials are available to the rhinoplastic surgeon to augment the nose. These include, alloplasts (synthetic implants), allogenous materials (obtained from cadavers), or autologous implants (harvested from the patient's own tissue). In cases of severe collapse of the nose, skin grafts may also be necessary in order to thicken the skin to achieve a satisfactory reconstruction. The nasal structure is a delicate part of the human anatomy, composed of small and intricate parts that are interconnected to create the shape of your nose. When the nose sustains an injury, any number of disastrous things can affect this carefully balanced structure, including broken bones, damaged cartilage, visible changes to the nose, internal deviations, asymmetries inside and out, and even trouble with breathing. Bleeding is also a cause for concern, as blood clots can form around the nasal septum and block it off from regular blood flow. This will lead to the death of this cartilage partition between the airways, a condition medically known as septal hematoma. The bridge of the nose may collapse as a result, leading to a saddle nose or boxer nose deformity. Post-traumatic rhinoplasty address's these injuries to the nose that can lead to damaged airways. The most common causes of these injuries are usually a result from sports injuries, car accidents, and fights. Following surgery to remove cancer or occasionally following facial trauma, the nose may be left severely disfigured due to the lack of tissue that has been removed or lost. Reconstructive Rhinoplasty refers to surgery required to restore tissue that is absent or has been damaged beyond repair. Surgical repair requires the use of grafts and flaps from various parts of the body to restore the missing component tissues. Due to the complex nature of this procedure, patients may require multiple surgeries over a period of several months. Additionally, reconstructive rhinoplasty is a specialized procedure, and patients should look for surgeons who have extensive experience in this area. Complaints about the nasal tip rank among the top reasons for rhinoplasty surgery. Many patients are unhappy with the way their nose points up or down at the tip, how bulbous or round the tip appears, or how pointy the tip is. As the most protrusive area of the face, tip projection is extremely important to how a face may appear and is perceived. Refinement rhinoplasty is a highly individualized procedure that specifically caters to each individual’s unique facial characteristics. Tip refinement can involve various tactics to fine-tune the nasal tip in a more pleasing fashion, one that complements the other features of the face. Your surgeon may add or remove cartilage and tissue in order to perfect the tip’s shape or direction. Patients are under sedation or anaesthesia for the entire surgery. First, your doctor will examine the internal structures of the nose with a 3D high definition camera before making any incisions. Underlying cartilage is then exposed for structural alterations. Depending on individual needs, fat tissue may be removed or repositioned to allow for better definition. Your doctor may opt to use implants to fortify the nasal cartilage and reorient the tip. Grafts are also available to aid in better tip projection. All incisions will be closed using small dissolvable sutures. A nasal surgery where the nose is surgically altered to create a symmetrical, aesthetically pleasing nose that suits the individual patient’s face without diminishing the patient’s ethnic characteristics. A surgical procedure designed to repair both form and function of a nose that has previously been operated on. Many people have difficult breathing from their nose or are dissatisfied with the cosmetic appearance of their nose as a result of prior nasal surgery. A surgical procedure that’s done to fix a deviated nasal septum. The septum is the wall of bone and cartilage that divides your nose into two separate nostrils. A deviated septum occurs when your septum is moved to one side of your nose. Some people are born with a deviated septum, but it can also be caused by an injury to your nose. A procedure to decrease the size of the turbinates. In short, turbinates are structures along the side wall of the nose that can swell and cause obstruction. By reducing their size, your breathing can be improved. A procedure where the sides of the nose at the bottom which are referred to as the alar are reshaped. In most cases this involves narrowing or reshaping the nose to improve the balance in relation to the base and the other structures of the nose. The ethmoid sinuses are located between your eyes and the bridge of your nose. They’re key to treating most sinus infections because all of the other sinuses drain through or next to them. So if your ethmoid sinuses are blocked, the infection can spread to the other sinuses. An ethmoidectomy removes infected tissue and bone in the ethmoid sinuses that blocks natural drainage. This procedure allows your doctor to remove the diseased tissue that make up the polyp and to also correct any sinus issues linked to the inflammation. The surgeon inserts an endoscope into the nostril to reach the nasal cavities, and through the use of small surgical instruments, lances the polyp. He or she might also create a wider opening between the sinuses and nasal passages to increase breathing ability. This procedure is also typically performed on an outpatient basis.